Richard Starkey Jr, MBE (born 7 July 1940 in Liverpool, England), known by his stage name Ringo Starr, is an English musician, singer, songwriter and actor, best known as the drummer of The Beatles. He was the oldest member of the band, and the last to join the now familiar 'Fab Four' line up. While he was sometimes the least visible member of the band, Starr's drumming style played a pivotal role in the music played and recorded by The Beatles. He filled the role he was hired for in 1962, then went on to establish a new approach to rhythm in popular music that some claim continues to grow in its significance and influence with every decade since The Beatles recorded their music. Starr is left-handed yet plays a right-handed kit; his tendency to lead with his left hand contributes to his distinctive drumming style. Lennon said of Starr: “ Ringo was a star in his own right in Liverpool before we even met. He was a professional drummer who sang and performed and had Ringo Starr-time and he was in one of the top groups in Britain but especially in Liverpool before we even had a drummer ... Ringo's a damn good drummer.” Drummer Steve Smith said: “ Before Ringo, drum stars were measured by their soloing ability and virtuosity. Ringo's popularity brought forth a new paradigm in how the public saw drummers. We started to see the drummer as an equal participant in the compositional aspect. One of Ringo's great qualities was that he composed unique, stylistic drum parts for the Beatles songs. His parts are so signature to the songs that you can listen to a Ringo drum part without the rest of the music, and still identify the song.” Many drummers list Starr as an influence, including Max Weinberg of the E Street Band, Dave Grohl of Foo Fighters/Nirvana, Danny Carey of Tool, Liberty DeVitto of Billy Joel's band, Phil Collins, Mike Portnoy from Dream Theater and others. According to Collins, "Starr is vastly underrated. The drum fills on the song "A Day in the Life" are very complex things. You could take a great drummer today and say, 'I want it like that.' They wouldn't know what to do." In his extensive survey of The Beatles' recording sessions, Mark Lewisohn confirmed that Starr was both proficient and remarkably reliable and consistent. According to Lewisohn, there were fewer than a dozen occasions in The Beatles' eight-year recording career where session 'breakdowns' were caused by Starr making a mistake, while the vast majority of takes were stopped due to mistakes by the other three members. Starr is also considered to have advanced various modern drumming techniques (for playing and recording) such as the matched grip, placing the drums on high risers for visibility as part of the band, tuning the drums lower, and using muffling devices on tonal rings, along with his general contributions to The Beatles as a whole. Specific drum parts executed by Starr in notably signature fashion include the fill that brings the drums and bass guitar into "Hey Jude", the steady rock beats in "Please Please Me" and other early Beatles recordings, the drum kit pattern through the bridge of "Hello, Goodbye", and the driving bass drum notes found in "Lady Madonna", underlying the more intricate, double-tracked snare drum. His use of a 'sizzle' cymbal (a cymbal incorporated with rivets that vibrate) would bring a much fuller sound than standard 'ride' cymbals. Two song performances where Starr is most renowned as a drummer are "Rain" (his personal favourite) and "She Said, She Said": his synching with McCartney's bass on the coda of "Rain" is considered one of his most memorable moments; on "She Said, She Said", his fills along with his smooth changing of meters from 4/4 to 3/4 have been highly praised. Lennon, McCartney and Harrison have all said that Starr was the best rock drummer in the world. McCartney took over the drums on "Back in the U.S.S.R." and "Dear Prudence", the first two tracks on the White Album (1968) after Starr had walked out, disgusted with the band's tensions and bored with waiting around to contribute. He did not return for two weeks until the other three Beatles urged him to come back. He spent the fortnight with actor Peter Sellers on his yacht in Piraeus, where he wrote "Octopus' Garden". Lennon sent telegrams to Starr, and Harrison set up flowers all over the studio for Starr's return saying "Welcome home". McCartney sent Starr a postcard on 31 January 1969 (the day after the band's performance on the roof of Apple Studios) stating: 'You are the greatest drummer in the world. Really.' This postcard is included in Starr's book Postcards From The Boys. McCartney also played the drums on "The Ballad of John and Yoko", recorded 14 April 1969) since only Lennon and McCartney were immediately available to record the song. Some have stated that while McCartney was able fill in for Starr, he did not possess the smoothness and dexterity Starr had. Starr commented that he was lucky in being 'surrounded by three frustrated drummers' who could only drum in one style. Starr also did not play drums on The Beatles' first-ever single, "Love Me Do". Session drummer Andy White was brought in by The Beatles' producer George Martin to record in place of Pete Best, and Martin claims to not have realized prior to the session that The Beatles had hired a professional drummer. Starr played tambourine on the version of "Love Me Do" featuring Andy White and maracas on "P.S. I Love You". Starr generally sang at least one song on each studio album, as part of establishing the vocal personality of all four members. In some cases, Lennon or McCartney would write the lyrics and melody especially for him, as Lennon did with "Good Night" from the White Album, and as he and McCartney did for "Yellow Submarine" from Revolver (1966). Often these melodies would be tailored to Starr's baritone vocal range. Although some have criticised Starr's vocal range when comparing him to his band mates, he turned in strong performances on par with other baritone pop stars, making an invaluable vocal and marketing contribution to the group. Starr's backing vocals can be heard on songs such as "All Together Now", "Carry That Weight", and "The Continuing Story of Bungalow Bill". Lennon and McCartney were the most prolific songwriters in The Beatles, Harrison wrote several songs, and Starr is credited with "Don't Pass Me By" (on The White Album) and "Octopus's Garden" (on Abbey Road) as sole songwriter. Starr's name also appears as a co-writer: on Rubber Soul, the track "What Goes On" was co-written by Lennon, McCartney and Starr; while the songs "Flying" (on the Magical Mystery Tour album) and "Dig It" (on Let It Be) are listed as being written by Lennon, McCartney, Harrison, and Starr. In addition, Starr wrote "Taking a Trip to Carolina" (on the second CD of Let It Be... Naked), and received joint songwriting credits with the other three Beatles for "12-Bar Original", "Los Paranoias", "Christmas Time (Is Here Again)", "Suzy Parker" (heard in the Let It Be film), "Jessie's Dream" (heard in the Magical Mystery Tour film) and The Beatles' version of "Free as a Bird". The Let It Be film also features "Jazz Piano Song", which is credited as a "McCartney/Starkey" composition. Each member of The Beatles sometimes contributed to songs without being given specific songwriting credits; for example, Starr provided the line "writing the words of a sermon that no one will hear" to the song "Eleanor Rigby", and he suggested that the priest could be "darning his socks", which McCartney liked and retained in the final lyrics of the song. Lennon also used Ringo's common original expressions, such as "A Hard Day's Night" and "Tomorrow Never Knows", and turned them into Beatles songs. Starr commented in The Beatles Anthology that when he presented a song to The Beatles, it would often sound to the other three Beatles like another popular song, and Starr recognised the similarities when they were pointed out. The White Album, particularly the song "Don't Pass Me By", continued to show Starr's taste for country music that he had brought into the band. Starr was often nicknamed the "Sad Beatle" because he was often frowning. Starr, on the subject of this, commented that he had the kind of face that, whether or not he was genuinely enjoying the moment, did not show much emotion. After the breakup of The Beatles on 10 April 1970, Starr released two albums before the end of that year. Sentimental Journey featured Starr's renditions of many pre-rock standards and included the production talents of Quincy Jones, George Martin and McCartney, among others. His next album, Beaucoups of Blues, put Starr in a country context, and included renowned Nashville session musician Pete Drake. He scored hit singles with "It Don't Come Easy" (1971) and "Back Off Boogaloo" (1972), the latter of which was his biggest UK hit, peaking at #2. He achieved two #1 hits in the US, with "Photograph" (co-written with Harrison) and "You're Sixteen", both in 1973. He also participated in The Concert For Bangladesh organised by Harrison in 1971, as well as drumming on Harrison's All Things Must Pass and Living in the Material World, Lennon's John Lennon/Plastic Ono Band, and Yoko Ono's early solo work. Indeed, his song "Early 1970" (the B-side of "It Don't Come Easy") voiced a hope that he could remain friendly and play music with all three of his former Beatles band mates. Starr then made his debut as a film director with the T. Rex documentary Born to Boogie. Starr became firm friends with T. Rex frontman Marc Bolan and during the period of filming the documentary, Starr released the single "Back Off Boogaloo". Starr remains the only Beatle to have failed to top the UK singles charts as a solo artist, although he did chart two number one singles in the US. He is also the only Beatle to have failed to top the UK album listings, his highest position being #7, achieved in the UK with both Sentimental Journey and Ringo; the latter reached #2 in the US charts, giving Starr his highest album position there. In 1971, he started a furniture company with designer Robin Cruikshank. Starr's own avant-garde designs included a flower-shaped table with adjustable petal seats and a donut-shaped fireplace. The 1973 album Ringo remains his biggest-selling record. Produced by Richard Perry with participation by the other three former Beatles on different tracks, Starr became the most commercially successful ex-Beatle at that time. The album Goodnight Vienna followed the next year and was also successful. Hits and notable tracks from these two albums included "Photograph" and "You're Sixteen" both reaching number one on the US charts, and "I'm The Greatest" (written by Lennon) from Ringo, and "Only You (And You Alone)" and "No No Song" from Goodnight Vienna. In late 1975 these singles and others were collected for Starr's first greatest hits compilation, Blast from Your Past, which was also the last album to be released on Apple Records.. During this period, he became romantically involved with Lynsey De Paul and inspired her prophetic song "If I Don't Get You, the Next One Will". He also played tambourine on a song that De Paul wrote and produced for Vera Lynn, called "Don't You Remember When". Starr's recording career subsequently diminished in commercial impact, although he continued to record and remained a familiar celebrity presence. Starr signed with Atlantic Records in the mid 1970s, and in 1976 the album Ringo's Rotogravure was released. While it did feature a minor hit single, the album sold only fairly well. This caused the label to revamp Starr's formula; the results were a curious blend of disco and '70s pop. The album Ringo the 4th (1977) was a commercial disaster, and Starr soon signed with Portrait Records. His stint with Portrait began on a promising note: 1978 saw the release of Bad Boy, as well as a network TV special. Sadly, neither were very popular, and Starr did not release another album with Portrait. In 1975, Starr founded his own record label called Ring O'Records, and four albums were released on the label between 1975 and 1978 (Startling Music by David Hentschel, Graham Bonnet by Graham Bonnet, Restless by Rab Noakes and a re-release of an Apple Records album, The Whale by John Tavener) as well as 16 singles by artists such as: Bobby Keys, Carl Grossman, Colonel Doug Bogie, David Hentschel, Graham Bonnet, Suzanne, Johnny Warman, Stormer, Rab Noakes and Dirk & Stig (the last being names of characters from The Beatles pastiche band "the Rutles", created by Eric Idle and Neil Innes). In 1980, George Harrison wrote "All Those Years Ago" for Starr to sing on his album Can't Fight Lightning which was later released as Stop and Smell the Roses, but then took it back and sang a re-written version himself, including it on his 1981 album Somewhere in England following John Lennon's murder. Starr, along with Paul and Linda McCartney, also played on Harrison's track. Starr was interviewed by Rolling Stone and Musician around this time. Stop and Smell the Roses was a well regarded album, but again did not sell particularly well. The Harrison-penned "Wrack My Brain" became Starr's last Top 40 single to date. Coincidentally perhaps, Lennon had also written a song for Ringo to use on Roses: "Nobody Told Me". However, following the murder, Starr did not feel comfortable recording the song; it was released posthumously under Lennon's name on the album Milk and Honey. After Lennon was murdered in 1980, Starr and his girlfriend Barbara Bach flew to New York City, to comfort Lennon's widow Yoko Ono. They were noted for having done so, while McCartney and Harrison did not. Although Starr had regularly guested on Lennon's and Harrison's solo efforts, and had had all three of his ex-colleagues guest on various records of his own, it was not until 1982 that he first was asked by McCartney to participate in recording sessions (for the Tug of War album). As was also evident with Harrison's "All These Years Ago", Lennon's death had in fact led to a public showing of reconciliation between the remaining Beatles. Old Wave, produced by Joe Walsh, was released in 1983, but the album was only released in Germany, Canada, Scandinavia, Australia and Brazil (the album finally saw belated US release on CD in 1994). In 1985, he performed, with his son Zak Starkey, as part of Artists United Against Apartheid on the recording Sun City. In 1988, Starr drummed on the George Harrison song "When We Was Fab" from his album Cloud Nine. Harrison had written the song with Jeff Lynne with the intent of making a modern song referencing the psychedelic Beatles era, ca. 1967. Reportedly, Harrison felt he "needed" Starr to drum on the song, basically saying something to the effect of, "I can't imagine a song like this starting without Ringo's 'da-da-dum, da-da-dum'." The song charted in the Top 30 in both the UK and the USA, and is often mistaken for a Beatles song. Beginning in 1989, after Starr had reunited with ex-Beatle guitarist Harrison and ex-Electric Light Orchestra leader Lynne on the Tom Petty song, "I Won't Back Down," followed by a stint in detox for alcoholism, Starr became a visible presence on the summer touring scene, organising a series of concert tours under the name Ringo Starr and His All-Starr Band, teaming with well-known musicians from various rock eras. The format of the concerts had Starr singing a couple of his Beatles or solo songs, then each of the other musicians taking a turn to sing one of their songs with Starr behind the drums, then Starr singing a couple more, then another go around, and so on. In this way, Starr is relieved from having to carry the full burden of the show, and the audience gets to hear a variety of music. The ninth such All-Starr Band tour took place in 2006. The success of the initial All-Starr tour led to Starr releasing his first album in nine years, 1992's Time Takes Time. It received substantial exposure and the track "Weight Of The World" got considerable airplay. Critics considered Time Takes Time Ringo's best recording since 1973's Ringo and was produced by four of the top producers in music: Phil Ramone, Don Was, Jeff Lynne and Peter Asher. The album also featured guest appearances by Brian Wilson and Harry Nilsson. In 1997, Starr guested on drums on two songs on the Paul McCartney album Flaming Pie. McCartney had written a song about Maureen Starkey ("Little Willow") and asked Starr if he'd play on another ("Beautiful Night"). On the day subsequent to the "Beautiful Night" session, the two recorded a jam session which developed into another song, "Really Love You", notable for being the first song ever credited to McCartney/Starkey and officially released on an album. (An earlier co-write called "Angel in Disguise" was cut from the album Time Takes Time, and a song on the Let It Be film soundtrack was also credited to the two.) 1998 saw two important albums released on the Mercury label. The studio album Vertical Man was well-received by critics and marked the beginning of a 9-year "partnership" with Mark Hudson, who produced the album and, with his band The Roundheads, formed the core of the backing group for the album. In addition, many "famous guests" joined on various tracks, including George Martin, Paul McCartney, and ― in his final appearance on a Ringo Starr album before his death ― George Harrison. Most of the songs were written by Starr and the band. The Roundheads and Joe Walsh also joined Starr for his appearance on "VH1 Storytellers", which was released as an album under the same name. On the show, he performed greatest hits and new songs, and told anecdotes relating to them. In 2001, Starr and Harrison were both guest musicians on the Electric Light Orchestra's album Zoom, playing on two tracks each. Later that year, he was shocked to hear about George Harrison's death of cancer on November 29, as he told MTV, Good Morning America, The Early Show, The Today Show, among many others show that "We will miss George for his sense of humor." In 2002 Starr was inducted into the Percussive Hall of Fame joining the elite group of percussive inductees, which includes Buddy Rich and William F. Ludwig, Sr. and his son. On November 29, 2002, Starr performed "Photograph" and a cover of Carl Perkins' "Honey Don't" at the Concert For George held in the Royal Albert Hall, London, on the first anniversary of Harrison's death. According to the official website, "Ringo Starr caught everyone with a tear in their eye with a rendition of 'Photograph', a composition he wrote with George, which seemed to sum up how everyone felt." The song includes the lines, "Every time I see your face / it reminds me of the places we used to go / But all I've got is a photograph / and I realize you're not coming back anymore". When drummer Carl Palmer was asked by fans in Mexico City about his drum set he used in a tour with Emerson, Lake & Palmer (reportedly valued at $25,000), his answer was that he sold it to Starr. In 2003, Starr began recording for the independent label Koch Records, releasing Ringo Rama that year and Choose Love in 2005; the former includes his stylish tribute to Harrison, "Never Without You", and the latter features appearances by Billy Preston and Chrissie Hynde. Starr toured again in mid-2006, with an All-Starr Band featuring Sheila E. on percussion, bassist Hamish Stuart (formerly of the Average White Band and Paul McCartney's touring band), and Edgar Winter. The tour was underway on Ringo's 66th birthday, 7 July 2006, when the All-Starr Band performed in Clearwater, Florida. Starr appeared on the Tonight Show with Jay Leno on 20 June 2006. He sang two songs; "What Goes On" from Rubber Soul and "With a Little Help from My Friends" from Sgt. Pepper's Lonely Hearts Club Band. Most recently, Starr featured on the Jerry Lee Lewis 2006 duet album, Last Man Standing; he performed a cover, with Lewis, of Chuck Berry's "Sweet Little Sixteen". In January 2008, the studio album "Liverpool 8", produced by Dave Stewart, Mark Hudson and Starr himself, was released. In January 2010, his latest album "Y Not" was released. Starr was the narrator of early series of Thomas the Tank Engine and Friends in the mid 1980's. He was also the original little conductor on Shining Time Station. Starr is alive and well today along with Sir Paul McCartney. Subscribe to Ringo Starr RSS Feed to get latest lyrics and news updates. 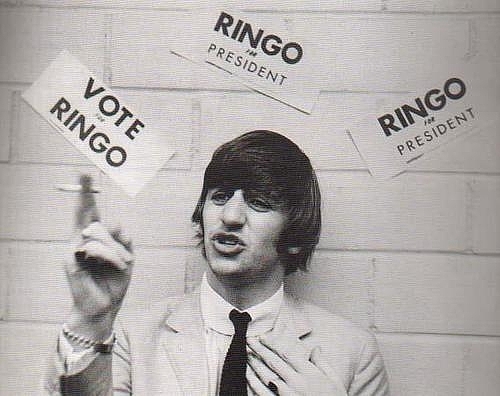 What do you think about Ringo Starr? Let us know in the comments below! Ringo Starr: I love Twitter!